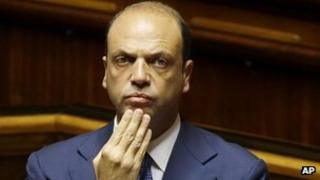 Italy's Interior Minister Angelino Alfano has survived a no-confidence vote in the Senate, triggered by a row over the deportation of a Kazakh dissident's family. The row has threatened the stability of Italy's ruling coalition. The opposition motion against Mr Alfano was defeated by 226 votes to 55. There are suspicions that the extradition was carried out as a favour to oil-rich Kazakhstan, which has a poor human rights record. Just before the vote, Prime Minister Enrico Letta strongly defended Mr Alfano. He told the Senate that the minister had not been involved in the expulsion of Alma Shalabayeva, wife of dissident banker Mukhtar Ablyazov, and their six-year-old daughter in May. But Mr Letta acknowledged that the deportation meant "embarrassment and disrepute" for Italy. Mr Alfano insists he was unaware of Kazakh diplomatic pressure over Mr Ablyazov's family. His chief of staff resigned over the affair this week. Ms Shalabayeva and her daughter were arrested by police who raided their home in suburban Rome in May and who then put them on a private Kazakh jet which flew them to the Central Asian republic. The Italian government has ordered an investigation into the case and has revoked the deportation order retroactively. Mr Letta urged senators to back the minister so the government could carry on its work of addressing Italy's economic problems. "What I am asking you for is a new vote of confidence in the government which I have the honour to lead," he said. Mr Letta heads a fragile coalition of centre-left and right-wing parties. Mr Alfano is an ally of the former conservative Prime Minister Silvio Berlusconi. UN human rights experts have criticised Italy over the Kazakhstan affair. The dissident's wife and daughter were legally resident in the European Union. "The circumstances of the deportation give rise to the appearance that this was in fact an extraordinary rendition which is of great concern to us," the UN experts said. Extraordinary rendition was the name given to the controversial US policy of handing over terror suspects to US-friendly countries where they were at risk of torture and other human rights abuses. Mr Ablyazov, a former energy minister and chairman of BTA bank, fled Kazakhstan in 2009. He was granted political asylum in the UK but his current location is not known. BTA filed a lawsuit against him, accusing him of siphoning off billions of US dollars from the bank. He denies wrongdoing, calling the case politically motivated. He is said to have funded opposition parties and media in Kazakhstan, where President Nursultan Nazarbayev keeps a tight grip on power and resists calls for democracy.